Eric Carle is a beloved children's author. Here are free printables from the Very Hungry Caterpillar, Eric Carle's best-loved kids' book. Mrs. Spatafora's Kindergarten Blog features dozens of printable cut and paste crafts. 1+1+1+1 is a blog with Eric Carle's The Very Hungry Caterpillar worksheets and printables. 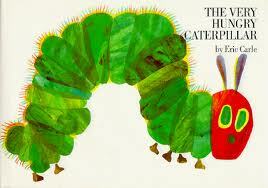 The Very Hungry Caterpillar is used in preschool and kindergarten classrooms to teach science. Here are free printable Eric Carle crafts from The Very Hungry Caterpillar. Making Learning Fun features free printable Very Hungry Caterpillar math games, reading games, butterfly and caterpillar crafts and other learning activities. Teacher Vision offers teachers, educators, homeschoolers and parents free downloads. up to three (for more, you must register). Here's an 8 page Very Hungry Caterpillar activity booklet. You can print the entire document free and it only counts as one of your freebies. 4shared has free printable Eric Carle Very Hungry Caterpillar matching puzzles and learning games. DL-TK has free printable Very Hungry Caterpillar felt board patterns that can be used as coloring pages.